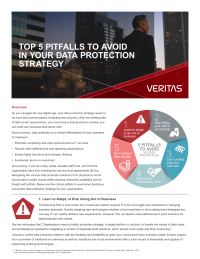 Download this paper to learn five critical pitfalls to avoid when building a successful data protection strategy for your organization. As you navigate the new digital age, your data protection strategy needs to be more than just the basics of backup and recovery. With the shifting tides of data centre requirements, you must have a data protection solution you can trust your business and career with. Navigating the various data protection solutions from physical to virtual and private to public clouds while ensuring enterprise scalability can be fraught with pitfalls. Eliminate complexity and interrupted access to IT services. Reduce staff inefficiencies and operating expenditures. Enable faster decisions and strategic thinking.